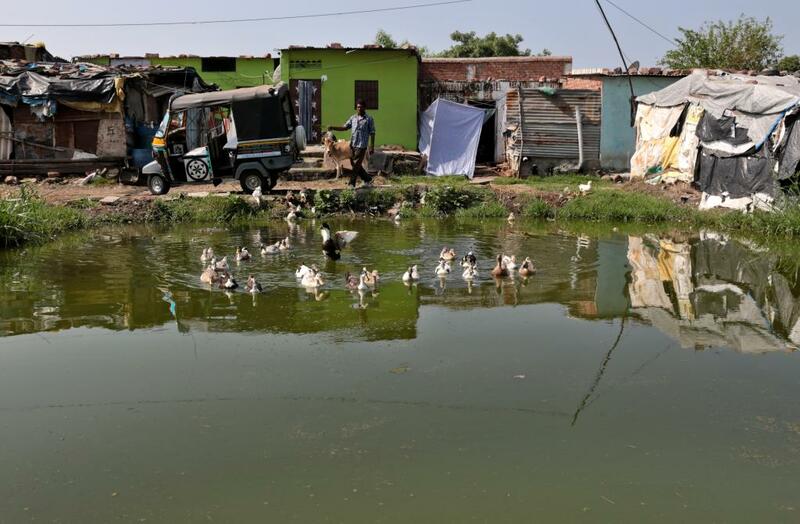 In a recent order given to the Ahmedabad Municipal Corporation (AMC), the Gujarat high court directed the civic body to prevent encroachment upon water bodies in Thatlej area by constructing fences around them. The high court also ordered Ahmedabad district collector Rajkumar Beniwal to take action against encroachment and dumping of waste in Thatlej area, which lies on the city’s eastern side. The next date of hearing is on October 14. The court order came following a Public Interest Litigation (PIL) filed before it by Aam Aadmi Party (AAP) member Ritu Raj Mehta in July this year. Encroachment of water bodies is not a new issue in Ahmedabad. In 2000, Shailesh R Shah, a local citizen, had also filed a PIL in the high court in this regard. In the PIL, he had requested the court to revive and recharge the Chandola Lake situated on the city’s fringes. A year later, there were widespread protests by the citizens to stop illegal constructions and dumping of waste in and around water bodies. In response to Shah’s PIL, the high court had come up with a verdict in 2003 in favour of protecting the water bodies of Ahmedabad from encroachments. But despite the order, nothing was to save the water bodies. There was no restriction put on the building activity around lakes. Water bodies are recharge structures and act as natural sponges. According to the latest Central Groundwater Board report, there has been a decline of three metre per year in the groundwater level of Ahmedabad in recent times. In the absence of proper protection laws, the city’s lakes are becoming vulnerable to encroachments and building activity, say activists. Water bodies lying in the eastern side of Ahmedabad have become a solid waste dumping ground. According to Mehta, the AMC is destroying open water sources by dumping wastes in and around lakes. According to news reports, continuous dumping of waste is affecting the health of local residents. There has been a spurt in the cases of vector-borne diseases in Thatlej area. In 1960, Ahmedabad had around 204 lakes. But by early 2000, many of these had been encroached upon, according to a research carried out by Delhi-based non-profit Cenre for Science and Environment. Shah’s PIL had mentioned the presence of around 137 lakes in the city. Out of these, at least 65 of these had witnessed construction of apartments and other structures approved by the government under various town-planning schemes. According to the CSE report, villages around Ahmedabad were assimilated into the city to expand the capital area. The town planners did not bother to take into account the natural drainage pattern and topography. This led to two things. First, rainwater that earlier used to flow into lakes and other low-lying areas started accumulating near new residential areas, thus giving rise to floods and water logging during rains. Second, the water bodies started drying up, thus making them an easy prey for land sharks. Ahmedabad’s groundwater level has dipped since 2000 and the city face water logging during monsoon, a CSE report says. More than a decade later, there is still no proper law to protect Ahmedabad’s water bodies. AMC is yet to identify those water bodies that need to be protected.